Our Compressors are not only inexpensive, but Super Quiet! 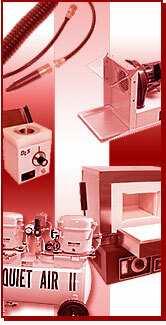 Call DLS for your bulk discounts on our ovens and compressors! Dear Dealers, we thank you for your orders and products you have purchased from us. Since 1983, we have been manufacturing the Quiet Air Compressors and they have been a big hit with the dental labs and doctor offices. Our latest line of equipment that we manufacture, the DLS-ERC product line, was taken over from ERC back in January of 2000 has been very popular amongst the labs for many years. We are happy to have these products here and look forward to doing business with you in the years to come. Details about our products including the 500S Burnout oven, DC100 Dust Collector, WP200 Wax Dipping Pot and Quiet Air Series Air Compressors. See photos of our products as well as use them in your next printed catalog.